Got personal digital storage yet? Got digital storage? If not, you might just be waiting for disaster to strike. Photo by Jannet Walsh/multimediatoolkit.me, ©Jannet Walsh. All Rights Reserved. If you think your digital files area magically protected from computer crashes or files disappearing in public data hard drives in the university labs, causing you to lose your website or video project, then you are living in a digital daydream. I’m publishing this to help my students at St. Cloud State University understand portable or external digital storage. Most importantly, I want students to avoid the learning experience of doing their website or video projects again and again due to improperly storing their work. Of course, there is much to learn in repeating an exercise. The project might actually come out better than the first attempt! 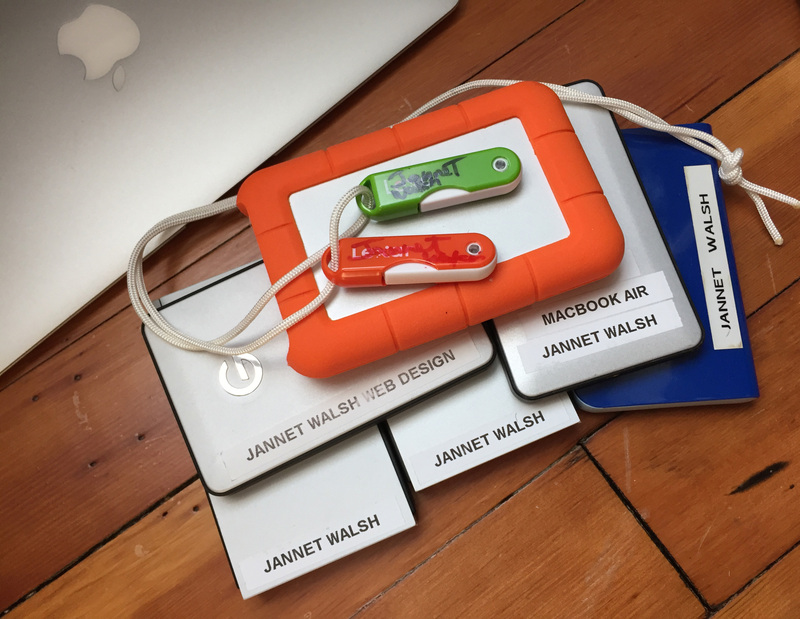 If you lose your video files and only placed them on a public hard drive, like the iMac DataHD in the computer lab, and not your own portable hard drive, you might be re-shooting an assignment or unable to complete the final video project. This could all mean disaster for your class grade if you run out of time. A small case for the digital storage is suggested, when you carry your valuable files, softening the blows from being carried and dropped . Photo by Jannet Walsh, multimediatoolkit.me, © 2015 Jannet Walsh. All Rights Reserved. Projects for the semester for Introduction to Multimedia course, COMM 240 at St. Cloud State University, require students have their own flash drive, at least 32 GB or external hard drive, recommended, for projects. It’s the responsibility of the student to provide additional digital storage. The Dreamweaver projects and video projects with Adobe Premiere Pro both require a lot of space, too much to just email your project to yourself. You can create a folder for yourself and store work on iMac DataHD. This is located on the Dock, the bar with the icon at the bottom of the computer. Proceed with caution: The files are public and not safe. Computers can crash, wiping-out files. Locally stored files prevent students from moving to other computers/labs to work. It’s important to use more than one of the following storage method. All students get 2GB of server space for storing files, which can be accessed through the little paw icon in the dock on the Macs in 117 and 119, in Stewart Hall, Saint Cloud State University. The Good: files are more secure and can be accessed from any computer on campus. The Bad: 2GB limit (not good for video), and not accessible when off-campus. 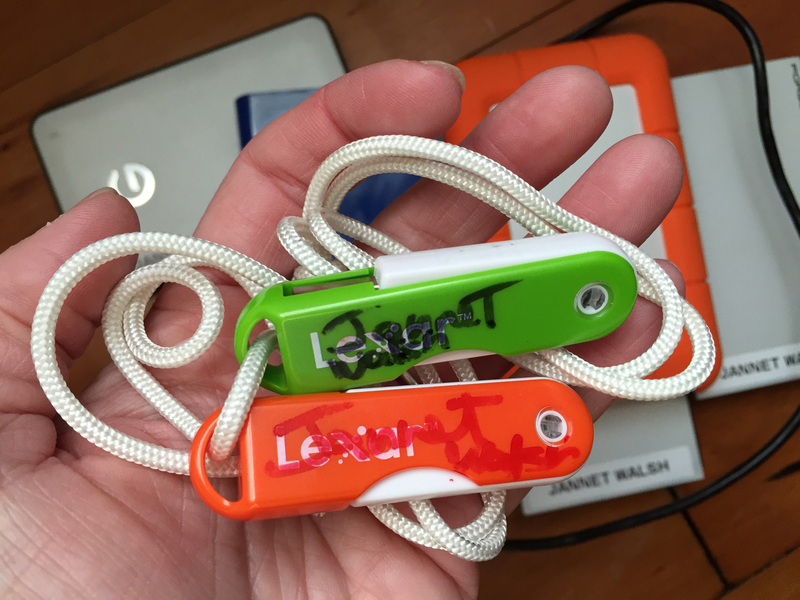 Label jump drive with your name and put a leash on it, like a cord or other way to keep track of this small item. When you lose it, you might have a chance of recovering it. Photo by Jannet Walsh, multimediatoolkit.me, © 2015 Jannet Walsh. All Rights Reserved. The Good: The easiest way to back-up and store files. A 32GB or larger drive for video files. The Bad: Easy to lose, could fail, possible size limitation and video files have to be transferred to the desktop computer in order to edit. 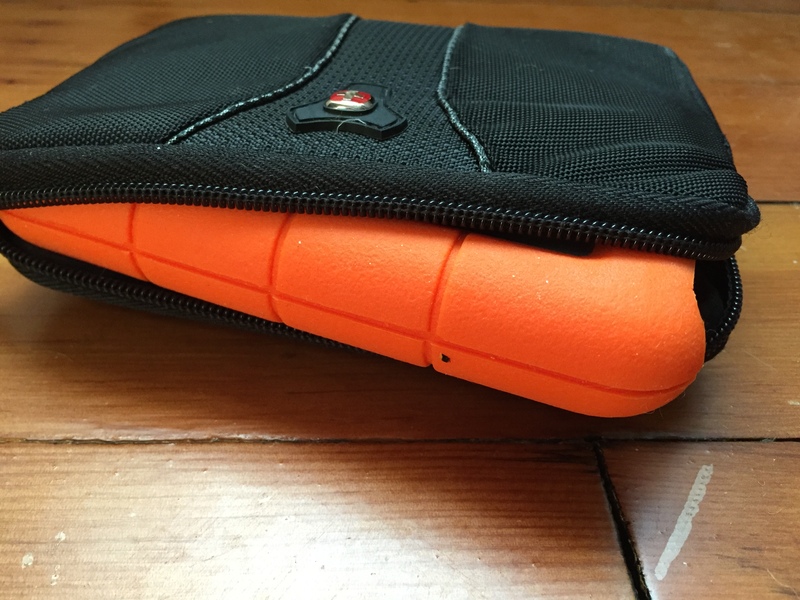 There are several brands of portable external hard drives on the market, with varying storage capacity. Label your hard drive! 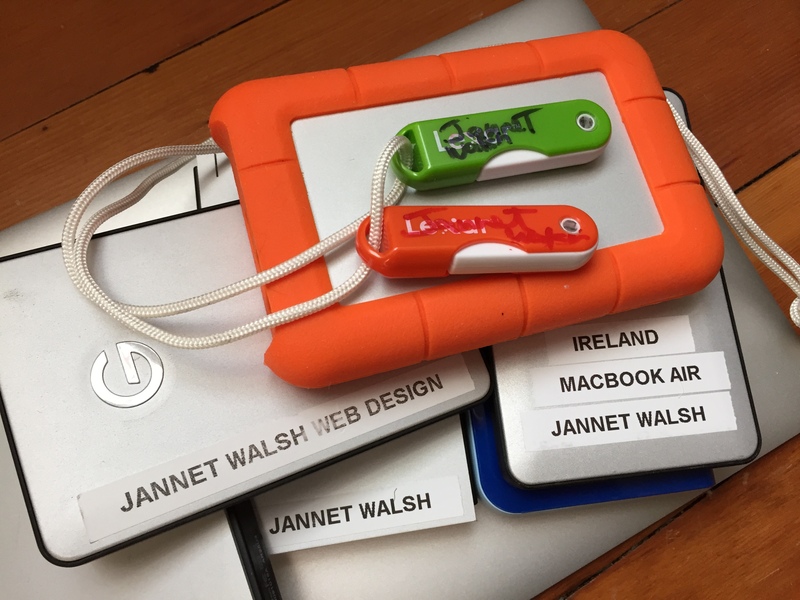 Photo by Jannet Walsh, multimediatoolkit.me, © 2015 Jannet Walsh. All Rights Reserved. The Good: Holds everything you will need. It’s portable, secure, can edit video files directly on drive. The Bad: Cost can be an obstacle (starting around $50 or so), could be lost or stolen, could fail and possible compatibility issues between Mac and PCs. There are USB ports on the back of you computer to connect external hard drive. Also, make sure you get a portable external hard drive, about the size of your hand or it will be too heavy to carry. Some hard drives need to be formatted before use. Sizes for storage start at about 500GB, then move on to 1T, 2T and more. Students are encouraged to use redundant methodology. Save all files in at least two different storage locations or devices to lesson the chance of lost files. The student computer store in the Miller Learning Resources Center, SCSU campus, has flash jump drives and external storage. Make sure you say it’s for a Mac. You can also find in stores that sell computer hardware like Apple, Best Buy and more. These are just suggestions. I suggest you get an external hard drive now for your projects. Posted in St. Cloud State University, TechnologyBookmark the permalink.